The Hyundai Santa Fe has been a very popular part of the Hyundai lineup for many years now and it’s only going to grow, especially after the release of the all-new 2019 model. A redesigned exterior, a huge selection of new features, and all the room you need, the new Hyundai Santa Fe is the perfect next step for you and your family. Whether you’re using it for your daily drive to work or have a few trips planned for the rest of the year, you’re guaranteed comfort and security no matter how far you have to go. 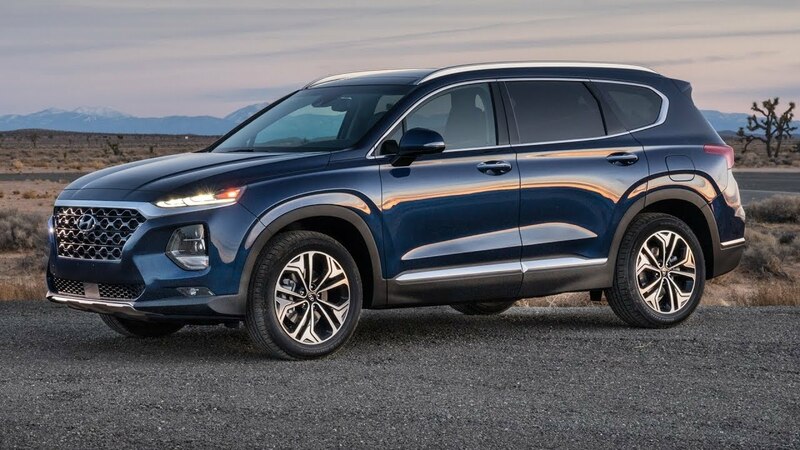 The new look of the 2019 Hyundai Santa Fe gives us a more refined and classy exterior than its predecessors and you’ll certainly get that “can’t miss” vibe. As part of Hyundai’s efforts to take things to a new level, the new Santa Fe will have a full LED lighting package available, which includes headlights, Daytime Running Lights, foglights, and front and rear turn signals. The new look is the trifecta: modern, stylish and unique. Once you get inside the Santa Fe, you’ll find leather-upholstered, premium seating with available heated and ventilated front seats. Add to that an available power driver seat with lumbar (!) and a cushion extension and you’ll never want to leave the driver’s seat. For those longer trips and more involved projects, make sure to take advantage of the 60/40 split fold-down rear seats that will give all the cargo space you’ll need. Load and stow everything you need with the touch of a button. The Hyundai Santa Fe has always been known for its smooth ride and superior handling and it’s about to get even better with 2019 model. Available HTRAC All Wheel Drive will provide you with even better traction and handling that will help you through any driving situation and dicey weather conditions. This type of AWD has the engine power, torque and braking controlled individually at each wheel, creating the best road-holding the Santa Fe has seen. 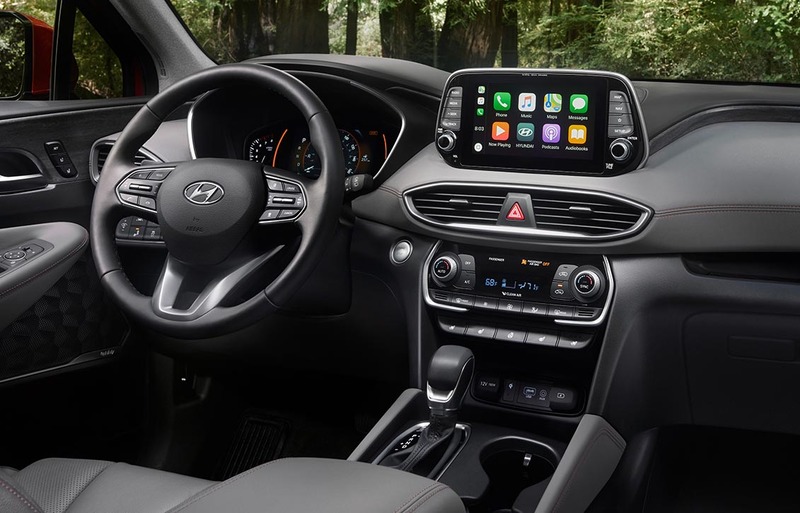 You can’t forget about all the technology this world has to offer – and you can find much of it right in the cabin of your 2019 Hyundai Santa Fe. We’re talking wireless device charging, Apple CarPlay/Android Auto, Smart Cruise Control with stop/start technology and of course, an Infinity Premium Audio sound system. Get where you’re going easily and have a good time while you do it! Safety is always one of the most important things too look at when shopping for a new vehicle. We can assure you that the Santa Fe has never failed and is only improving. The 2019 model has an available suite of advanced safety features that uses new types of technology to provide even more security and convenience. Ford Collision-Avoidance Assist with Pedestrian Detection, Safe Exit Assist, Rear Occupant Alert and Lane Keeping Assist are just a few of the available features that will keep you and your family as safe as possible. Feel free to explore every feature and see how you can make each one work for your driving needs! The 2019 Hyundai Santa Fe is officially here at Lester Glenn Hyundai! We’re excited to share this awesome new vehicle with you and we’re here if you have any questions! Visit us at 386 Route 37 E in Toms Rive, NJ 08753. We look forward to meeting you! Jeep is in the Fast Lane to the Future! Join Us for the Ride!